Buy one. Use it. You may get used to it. If not, put it in the safe or sell it. Glocks are relatively cheap compared to sigs, hk, et al. You can try to resist but if you give it a chance, likely you’ll have a bunch quick. . I bought a G45 today. 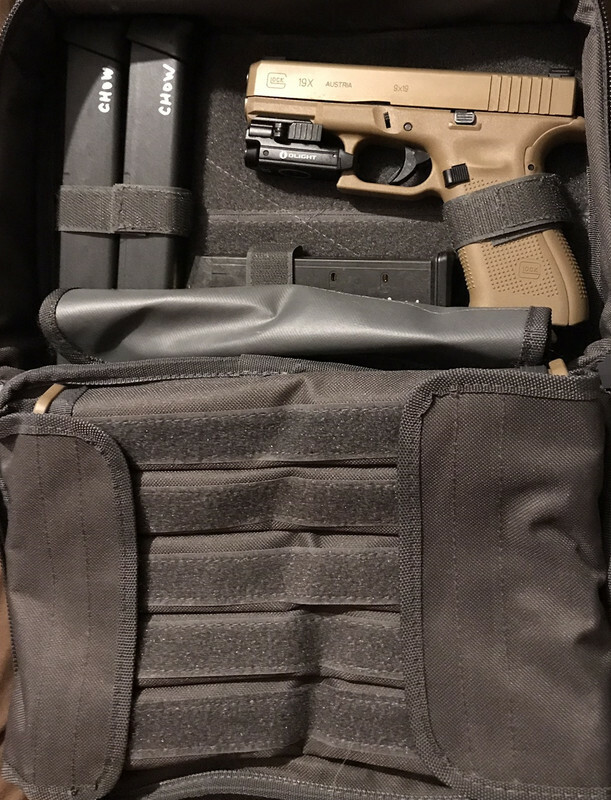 My first Glock. I have resisted because I mostly shoot cast bullet reloads. But I figured I should probably have a Glock. I like the features, full size frame with shorter barrel and slide. It reminds me of a Colt Commander. Yup, ordered a G45 today. If only I could have waited it out. Might have to sell my baby poop 19X and get a G45.. But then again maybe keep the 19X for the longer front strap, 19 rd mags, and night sights. so the designation 45 ... is for a 9mm? Ironic, I realize it was probably the next number in their line up but I wonder why they didn't make it a 45 caliber? Because Glock model numbers have no correlation to caliber. None. Never have. Keep both. My 19X night sights I gave away since the gen5 sights don't work for me. I'm standardizing on Ameriglo Agent gen3/4 sights on all my Glocks. I already ordered a set for my Glock 45 which I'm told will be ready for pickup next Friday. I will make a spot for it in my 19X case. I also have a TLR-7 ready for the 45 as well. 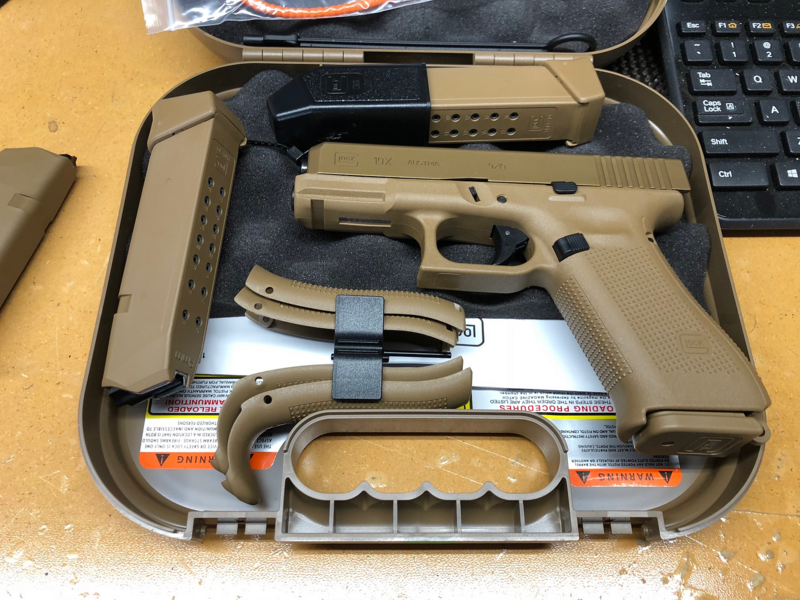 Yep, that's why I said "I realize it was probably the next number in their line up"
I re-entered the glock ownership with an FDE G17 3rd gen. New for mid-$400's. May never shoot it, but its there for the collection. Wish I never sold the G20c from the 1990's though. Mine shipped, will be at the FFL Tuesday. Ameriglo Agents and an OEM extended slide release on the way as well. Already plenty of 17/19/21/22rd mags around. I've tried 3 times to buy a Glock. Every time I've left the store with the Pistol I was comparing it to. You, sir, are a latent glockosexual. Here's a couple of passes to the bath house. The one time I bought one was the G43 and I went in without a comparison. Oh, I spoke too soon. There's no latency, but you are in denial. You have, in fact, bought a Glock and it's only a matter of time before you give yourself over fully. You know what they say- bipistolality is just a stopover on the way to Glockville. Sorry, but the G43 is no more. I didn't like it, and never shot it, so there was just no reason to own it. I stand by my original theory: you either love them, hate them, or modify them until you like them. How do you know you don’t like it if you don’t shoot it? I see that you used your bath house passes. It's OK. You're among friends. The Gen 5 MOS models intrigue me, this coming weekend I may need to check them out (if a LGS to me has them). I gave in and got my first in 15 years. Got a 43 used at Cabela’s. It looked new and the price was right. All that’s left is some range time and finding a holster. Yup G45 came in today. Bought and picking up two more: G26 Gen 5, G19 MOS Gen 5. In a couple months, my department is transitioning from 15+ year old Sig 229s to the G17 Gen 5. Maybe I should clarify. I shot it quite a bit. I tried to get to where I liked it. After quite a bit of shooting I found that I took it to the range less and less. I always wanted to shoot something else. After a while I found I was just leaving it in the safe, or putting it in my range bag, but shooting something else. All because I never got to where I liked shooting it. So I finally decided to sell it. The thread title doesn't only mean that you will, in the future, buy a Glock at some point. It also applies to present and former owners.